I’ve had clichés on my mind rather a lot recently (and yes, you don't need to point it out - I know, and it was intentional) … they tend to come in for a lot of criticism from some; although it could be said that any critic who accuses a book of being clichéd is guilty of hypocrisy. Or maybe simply doesn’t recognise a cliché when it jumps up and bites them on the nose. So I just don’t subscribe to the view that the only good cliché is a dead cliché. I think they have their place – their very familiarity can be comforting, can make for quick, easy reading at times and are less likely to slow the action in fast-paced plots. What’s more, if you consider that a cliché is an expression which lacks originality and impact through overuse – what about those who have never come across them before? When you meet a cliché for the first time, for you if not others, it will be original and have impact and be a bright and shiny thing. It is only as you grow older and read more that it starts to lose its lustre. Although in some cases, with time it acquires a less gaudy and more attractive patina instead. I loved the one where she threw her head in the air. I read one not so long ago where the character threw his hand in the air. I did wonder at the time who would catch it on the way down. Great post. I loved reading it. Great fun, Karen! while original imagery can be incredibly powerful, especially in poetry, in a novel sans clichés it would be overwhelming and also can appear to be deliberate avoidance of cliché, consciously trying too hard, which interferes with the process of getting lost in the book. 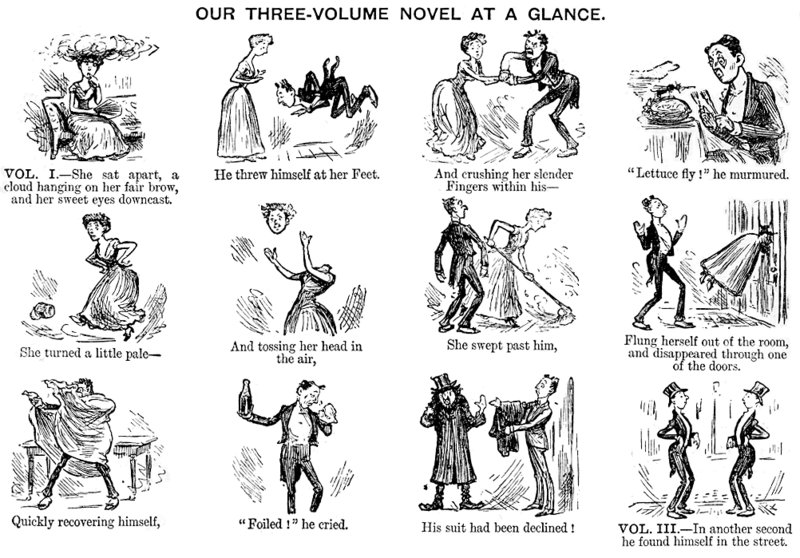 We've had great fun on facebook with quotes from novels of the 'head in the air' variety, many of them are best sellers with lots of hype and so clichés don't stop a book selling! Since I'm a harsh critic of cliché, I suppose I'm going to have to disagree. 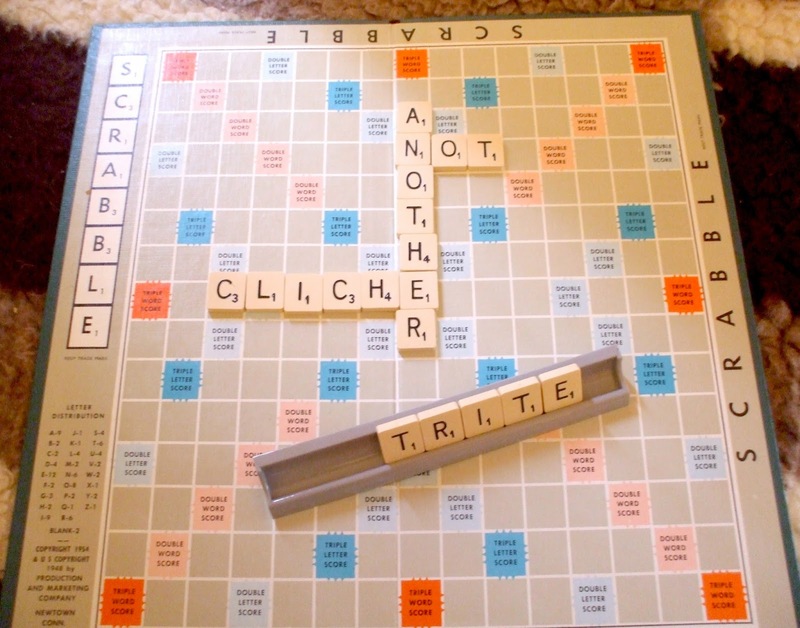 Cliché does have its place, of course - used in a character's voice, for example, or for the sake of irony -- and you make a good point about readers, particularly children and teens, coming to a cliché for the first time, but otherwise? No, they're awful. Sloppy thinking, sloppy writing. And I'm not limiting this just to phrases, but character traits, plot developments etc. The question, of course, with the latter is how to distinguish between archetypes and clichés. Unless I can see a good reason straight off for 'it was a dark and stormy night', I wouldn't be likely to read on. Language is too important, and the older I get, the more impatient I become with stuff that is merely a so-called 'good story'. Sure, I want to find out what happens, and generally twenty minutes of a page here or there, plus the ending, will do. I want books that I can savour, not race through. Books that I can puzzle over. That make me bang my head on my desk in frustraton and envy because I'll never write anything that good. Of course, I've got a quite a number of clichés from my own writing that I may send to your rescue centre! 'Bang my head on my desk in frustration' to name but one (whoops! there goes another one! ), eh Lee? One of my favourites is about Germans not having a sense of humour. Maybe you've lived there too long? And what about old Bill S? Practically everything he wrote became a cliche. To be or not Toby. That is the question! Well, Jan you did note my last sentence, didn't you? And of course, my evil plan is to write well enough for my own phrases and metaphors to become the next generation's clichés! P.S. Dear me, Jan, next you'll be accusing me of being a Nazi. Or a humourless Mugabe sort, since I lived just as long in Zimbabwe as in Germany. And don't forget my liking for torture, as an American. Terry Pratchett described cliches as 'the hammers and screwdrivers in the toolbox of communication'. Meaning, sometimes you have to use them, because they are just so... useful. They are just another form of language. A cliche is like a word: 'he threw his hands up' is no more exceptionable than the word 'hand'. We recognise both, and both are useful in their place. I hesitate to call all common idioms 'cliches' anyway. To my mind, a common idiom only becomes a cliche when it is used lazily, without thought, when another phrase (perhaps also common) would do better. So saying a guest at a garden party is 'cool as a cucumber' might be okay, because cucumber sandwiches are part of the setting. But saying a pilot is CAAC is less apt - you might instead say that he is 'calm as the clear sky' (to pluck one out of the air). The rule of thumb is: think before use. As to your liking for torture, surely being American is torture enough? (cliche and racist joke combined - what more could a woman want? (cliche)! Busis aus England. Terry Pratchett is wrong. Clichés are as useful as a hammer against your thumb; as painful. Sure, Jan, I didn't really think you meant it quite so baldly. You get my point now, perhaps, about the laziness of clichés? In most cases - of course there are exceptions, Nick's considered use - a cliché blocks thinking, which is my main objection to it. The opening sentence became famous as bad writing not because of 'It was a dark and stormy night' - which is a plain, simple statement of fact - but because of the long, tangled, clumsy wording that follows it. 'It was a dark and stormy night' simply became short-hand for the rest of the opening paragraph. Which, it might be argued, is bad writing because of style rather than cliche. But I love argument and wrangling, me. It's how you tell people are alive - they argue. Susan, thanks, I didn't know the source of 'dark & stormy'. The thing is, a cliché is often an effective phrase till it becomes a cliché. Its aptness is why it becomes one. Think of it this way: the more you tell your kids something, the less they pay attention; the less your words work. So too with clichés. And given Pratchett's sense of humour, I'd hazard that he wasn't being quite serious. But I don't have access to the context. The rain came down in lumps. The driver rung 'is bell. So 'e's on 'is way to 'Alifax. And talking of cliches, and language, have you read this brilliant Nick Cohen piece yet? 'It was a dark and stormy night' always reminds me of Snoopy, sitting on his kennel, typing. It was always the way he began his books. Arguably much worse than cliches (because in a way, they've become cliches because they are true) is Snoopy's other big problem: writing himself into a corner. It drives me wild when somebody writes themselves into a corner and then the plot all goes to - er - hell in a handcart, at the end. I'm sure that's what happened with the last episode of Silk. You get there and feel cheated. If anyone really wants unrelenting originality, try reading 'e'--an entire novel without that particular letter. Here's a cliché finder for Karen's rescue center. What about "It was a dark and stormy knight..."? Is that a cliche too? Debbie, only once he slays the princess with his mighty sword, marries the dragon, and lives happily ever after. A few of us wrote a round robin short story with that line as a starter. It was hilarious and followed similar lines to your interpretation. Karen, thanks for starting one of the liveliest discussions on these boards in quite some time. I wait with Braided Beth for the next installment.